Expressive art’s creative process can help people of all ages improve their health and emotional well-being. Art teaches a child to shift emotions that are concealed inwardly to an outward expression of themselves. The process of creating art provides a deeper emotional connection and understanding of one’s self. 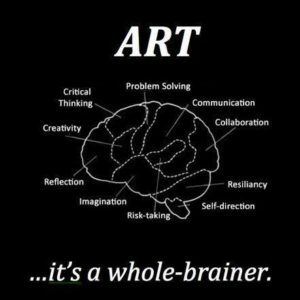 Art also allows the left and right hemisphere of the brain to work together to help gain greater insight about emotions and thoughts.